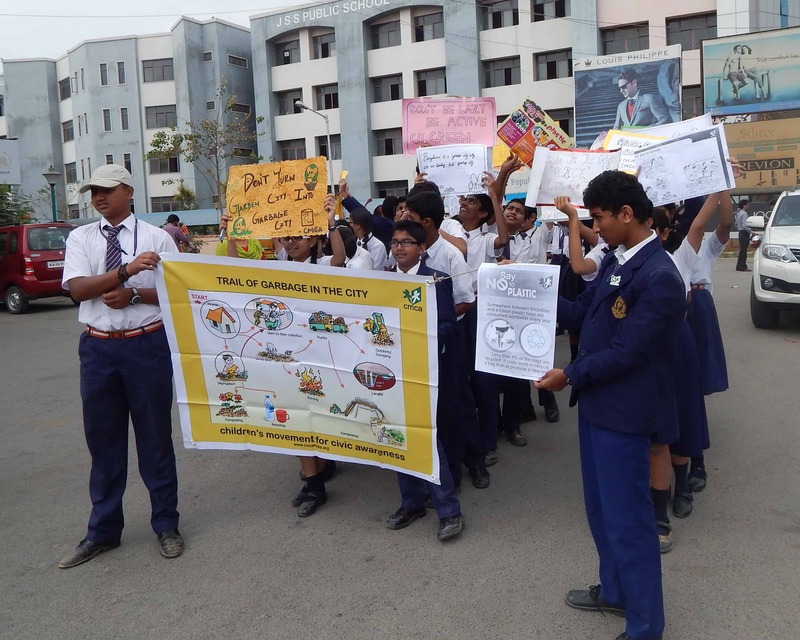 On February 20th 2014, members of Civic Rangers and Star Revolutionaries of the CMCA and Civic Clubs of JSS Public School, HSR Layout in Bengaluru, conducted a campaign at the HSR layout BDA Complex on Solid Waste Management. The aim was to make the complex a litter-free zone and spread awareness among the shopkeepers on the importance of segregation at source. The seed for the campaign was sown during one of the CMCA sessions at the school, where students had to do a mind-mapping exercise. Following the session, many students expressed the need to get the area surrounding their school cleaned, especially the BDA complex. They also noticed that there was a lot of garbage being dumped near their school compound. CMCA civic tutors and students met the Assistant Engineer, BBMP, to discuss the issue as well as what could be done about it. Civic Club members, Deeksha S and Pujitha, regularly met up with the AE and tracked the black spots. They noticed that though the spot was being cleaned up every day, garbage was being dumped once again. The tutors at CMCA, Parvathy Eshwaran, Krupa T S and Dr. Shanthi organised sponsors for the boards. 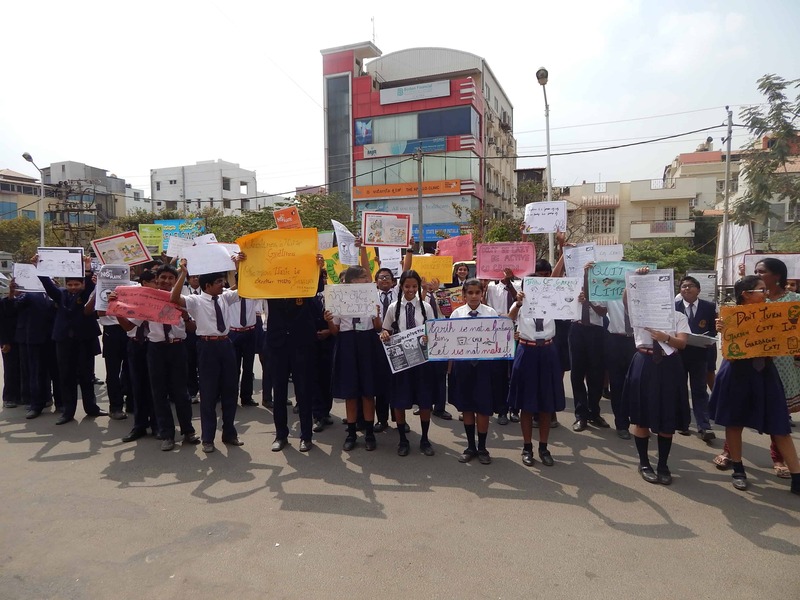 With the teachers from JSS, Mrs Srividya and Mrs Geetanjali, and students, willing to participate in the campaign despite their busy schedule due to the approaching final exams, they took to the streets. The students visited all the commercial units and BDA offices in the complex and educated the people there about what needed to be done with their wet and dry waste. Dr. Shanthi was pivotal in making arrangements with the Dry Waste Collection Center(DWCC) to regularly visit the complex and collect the dry waste from the shops. They also requested eateries in the complex to maintain separate bins for wet and dry waste, which they were willing to do. The eatery owners however expressed concern over public/ customer behavior in segregating waste. The students then spoke to a few of the customers about the need to segregate waste and dispose of it properly. 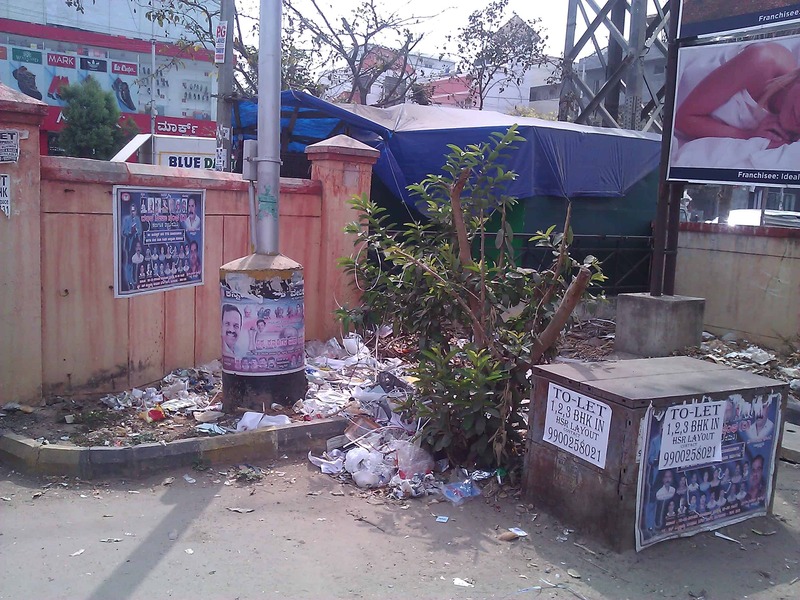 They also put up posters around complex to promote waste segregation and anti-littering. 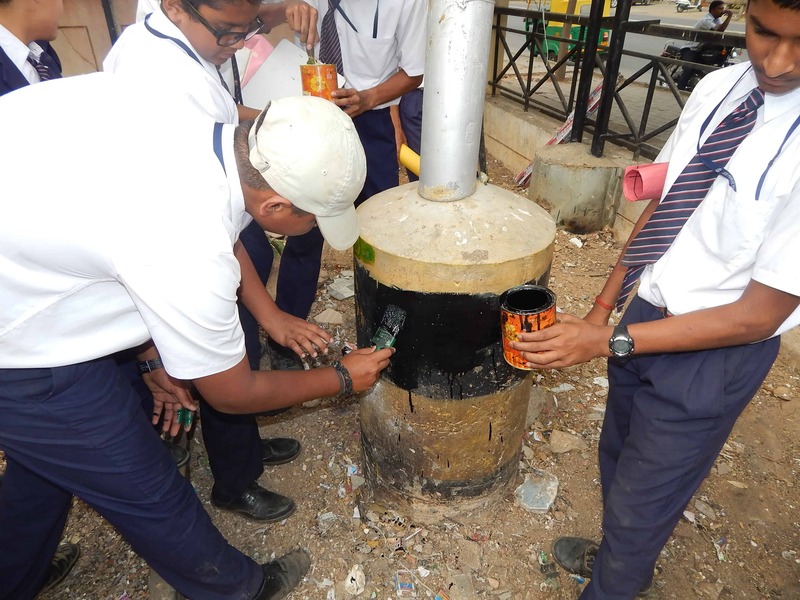 The Civic Club members made arrangements with the Assistant Engineer to keep garbage bins around BDA complex, who said it would be done in a week’s time. 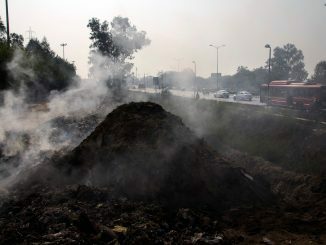 The AE also promised to send out a notice to all the commercial units in the complex, to direct them to segregate garbage, dispose it appropriately and keep the premises clean. 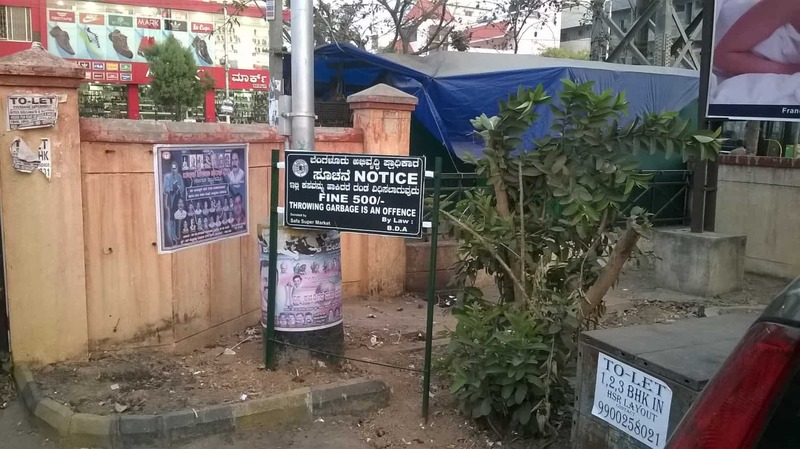 The enthusiastic students also cleaned up several black spots around the complex and put up posters requesting people not to litter the area. They painted the pavement too, to discourage littering. The campaign saw participation from around 60 students from JSS School. Several volunteers from CMCA too pitched in – Nirmala, Lalitha Rani, Rajani, Bala, Lakshmi, Lakshmi Ramanathan and Anupama are some of them. The huge turnout certainly helped in making the cleanliness campaign a success. The exercise proved that if all the stakeholders – customers, commercial units and BBMP – work together, it is possible to make the city garbage-free.